The location and view could not be more perfect. The large picture window is like looking at a National Geographic tv show. There were otters, seals and dolphin in the area almost all the time with tons of birds to enjoy as well. The spotting scope provided on a tripod is a wonderful touch. The house has a wonderful walking trail that leads to a point to watch the sunset in one direction and a nice restaurant and bar in the other. Big Sur and the 17 mile drive are easily reached from this location. While there are a few fixtures that could use updating, the pictures you see are exactly what you get. The furniture is comfortable and the instructions on how to use everything are precise. The kitchen is also well outfitted for cooking at the house and enjoying the view from the dining table. All in all, this place is fantastic. Downstairs, there’s an office area off the entry, a laundry room, a bath with a shower, a den with two sofas and a TV, and two additional guest rooms. One has a Queen bed, the “blue room" has three twins (bunk beds and one separate twin) along with ocean-themed murals on the walls and ceilings. What a lovely place. The view was spectacular and the house a joy to stay in. I had not thought of the advantage of staying on the ocean and yet facing north. There was no blinding glare in the afternoons and we had fantastic sunrises as well as constant beauty to look at. I will certainly try to stay there again if I ever get back to Pacific Grove. Everything was great....as described on vrbo. Loved everything about the house and neighborhood. Only issue was the envelope with the key wasn't in the mailbox outside your office.....it was in the office, but no notification of that. It turned out ok, but your notes should have indicated that the office was a possibility. Maybe I missed that direction???? Great place! Amazing views, lovely accommodation ideal for us travelling as 2 couples. The communication was first class and easy to follow instructions were received ahead of our arrival. We really enjoyed watching the otters from the window and stargazing at night! Perfect!! The view from upstairs is beautiful! The location is great! The house is very roomy and was very clean and comfortable. The kitchen was well supplied for cooking and even had things like soap, foil, spices and a few staples available. The bath was well supplied also. A few things that could be improved - need darker curtains or blinds that open in master suite. Lots of car headlights shining into the bedroom. Also, the ice maker in fridge and jets in bathtub don't work, if that's important to you. Also, the cleaning fee seems excessive. Guests are asked to volunteer, but not required, to empty trash, strip beds, start dishwasher, which we don't mind at all, but not with a $299 cleaning fee. I feel like that fee could be reduced. With all of the taxes and fees, the final price was almost double the advertised price. What a beautiful home! Perfect location for downtown Pacific Grove. Kitchen is fully stocked. Living room has a view that makes you never want to leave. They even have a telescope so you can check out all the activity in the ocean! Great library downstairs. Plenty of bathrooms. Huge garage. It was amazing for our girls weekend. The only slight downside is the kids room is not really designed for having adults in there. But with 4 of us, it was great! 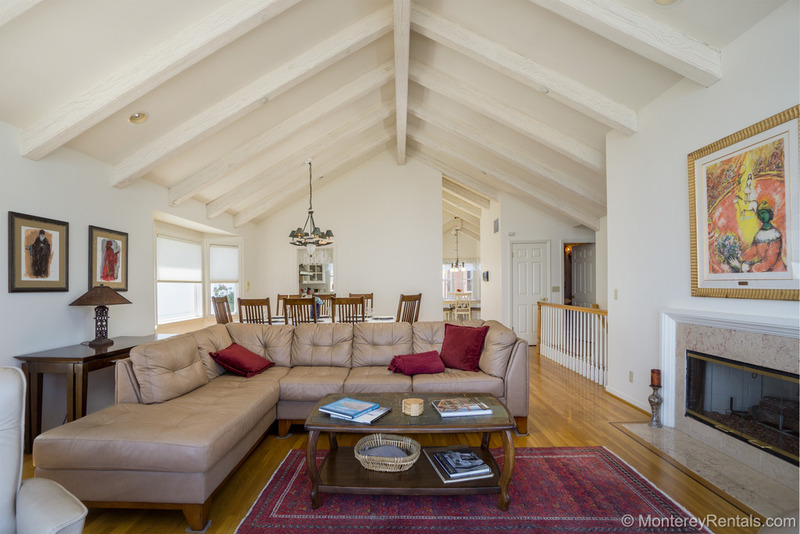 We loved the huge open upstairs space with unobstructed views of Monterey Bay. Kitchen worked well (needs a good grater!!). The master suite was very large and comfortable. We noted the careful instructions for all situations - very helpful. An elegant and welcoming place. One small downside - the cleaners had used too much bleach in the downstairs bath and it took a long time for the smell to clear out. The process to reserve the house went smoothly. Mostly on line, but with some phone calls. Michelle was great in answering questions and helping make the reservation. Check in was easy and they were ready for us when we arrived. Only took a minute or two. Directions in the written materials were quite good and thorough. The house itself was great and just as advertised. It was clean upon arrival and well furnished with everything we needed. Since there were only four of us and we ate meals out for the most part, we did not take full advantage of the house. But the beds were great and showers and bathrooms great. Hard to suggest any improvements. One very small suggestion would be directions for the master shower. In order to get warm water, one needs to have the control set in the middle. If you go all the way counterclockwise, it turns cold again. It took us a shower or two to figure this out. But once we did, it worked great. It was a fantastic house, immediately when you step through the door.Great to see the whales and other animals throughout the window of the livingroom. Blue Horizons was the perfect place for a reunion of high school friends turning 60! The home is just as advertised - super clean, large, fully stocked and perfect. The property management company was easy to work with and responded quickly to every question. Highly recommended. We would rent again! The location and view could not be more perfect. The large picture window is like looking at a National Geographic tv show. There were otters, seals and dolphin in the area almost all the time with tons of birds to enjoy as well. The spotting scope provided on a tripod is a wonderful touch.The house has a wonderful walking trail that leads to a point to watch the sunset in one direction and a nice restaurant and bar in the other. Big Sur and the 17 mile drive are easily reached from this location. While there are a few fixtures that could use updating, the pictures you see are exactly what you get. The furniture is comfortable and the instructions on how to use everything are precise. The kitchen is also well outfitted for cooking at the house and enjoying the view from the dining table. All in all, this place is fantastic. Marvelous house with a spectacular location.We had a three generation vacation, and all loved the house. I will be looking to return in two years when we hope to be back in the area, as this house is really That good. We loved watching the sea otters from the front window every day, anytime of the day. Pacific Grove is a neat town with lots of charm. Kitchen is well equiped. My only quibble is it is missing a Real grill. Has both a stove top grill and a mini-Weber grill, but in cooking for a group, neither is adequate. Still a 5 star place! Sounds like you had a 5 star vacation! We passed your comments to the owners, and they purchased a full-sized Weber barbecue. My wife suggested that we rent a home for our family, and her parents and sister to join us in Carmel for Christmas. After reviewing what was available on-line, I quickly told her that we needed to stay in Monterey and that I have the perfect place! She was disappointed at first, but she felt better when she saw the place, and when we were there, she said this is much better than what she was thinking for Carmel and she's so happy that we decided to stay there. Our view on Ocean View Blvd was incredible! Oh My!!! It was the most heavenly view!! Did I mention that we had a great view? Ha! There were seven of us, and it slept seven with 3 great bathrooms, a fantastic kitchen and plenty of room to hang out in a room by yourself too. Check-in and check-out was extremely easy. All instructions were simple. Although we didn't get the fireplace to work, we got over it quickly enough and we were completely amazed how friendly and helpful the young lady was when we called the help number to discuss the problem on Christmas Eve. Each morning involved a walk on the coast. The afternoons were in Pacific Grove, Monterey, and even Carmel. My father-in-law and I even got to play golf at the Pacific Grove Golf Course. Thanks for the great stay and I hope to see you again.